The Silver Palm can help you select the perfect facility for your event or assist in coordinating and managing your event at your chosen facility. 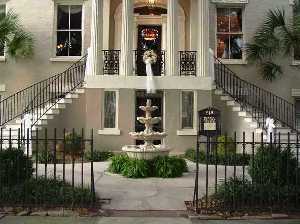 The Silver Palm has established relationships with the Marion Hatcher Center, the Old Medical College, the Richmond on Greene, Sacred Heart Cultural Center and the Savannah Rapids Conference Center. The three story Georgian style home was built in 1835 as the family residence of John Phinizy, a wealthy Augusta merchant and businessman and remained in the family until 1933. Since that time, Poteet Funeral Home and the Augusta Lodge No. 205, B.P.O. of Elks have owned the building. William G. Hatcher Sr. and MAU Inc. purchased the building in 1993. The Phinizy Building was renamed the Marion Hatcher Center in honor of Marion, the late wife of William G. Hatcher Sr. The Marion Hatcher Center is currently used for weddings, receptions, parties, luncheons, business meetings and other gatherings. The Greek Revival style building was MCG's first academic home. The original floor plans included a heating system, a laboratory, a Roman cement facade, a skylight and a grand hall down the center that divided two large lecture halls withh an expansive rotunda and staircase. Construction lasted from 1834 to 1836. MCG occupied this building for 77 years, vacating when the doors closed for the holidays in December 1912. The Academy of Richmond County used the building until 1926, the Garden Club of Augusta later used the building and the MCG Foundation presently leases the property. It is used for MCG and community events. Built in the 1960s as a modern annex to the historic Richmond Hotel, the Richmond on Greene has been meticulously remodeled and upgraded to become Augusta's premiere private and historic event location. After the hotel closed, the building was used for a period of time as the Augusta Athletic Club. It sat vacant for many years before Augusta businessman Donnie Thompson purchased it and created this spectacular venue. The four-story facility includes two floors of parking, a third floor with a spacious welcoming lobby, a ballroom, the Great Room and a commercial kitchen. Rooms are available for special events on the fourth floor. 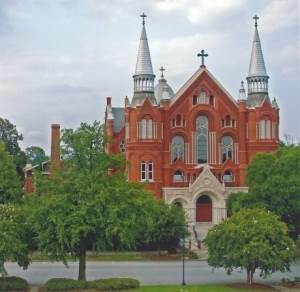 Sacred Heart Catholic Church, built by Jesuit priests, had its first service Dec. 2, 1900. After 70 years of operation, the last service was conducted on July 4, 1971, and the facility was closed. The magnificent barrel-vaulted ceiling, the 92 stained glass windows, and intricate brickwork make up this architectural gem. After years of vacancy, vandalism, and near destruction, this treasured historic site was reopened in 1987 as a prized landmark and a vibrant facility for community use as a cultural center. 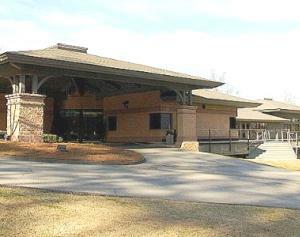 Owned and operated by Columbia County, Savannah Rapids Pavilion is a self-supporting multi-purpose community/ conference center. 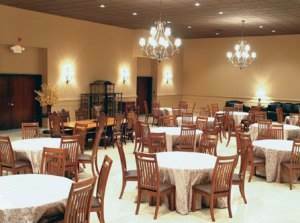 The pavilion offers a variety of rooms ranging in size from a 12-person conference room to a banquet room capable of accommodating 500. Savannah Rapids Pavilion is situated on an 80-foot bluff overlooking the beautiful Savannah River and the Historic Augusta Canal. The facility offers a commercial kitchen on the main level and a limited kitchen on the lower level. Moveable partition walls permit the facility to accommodate small or large functions such as family reunions, weddings and receptions, conferences, seminars, trade shows, training sessions and organization meetings.